Come one, come all! The worlds strangest Super Heroes are back, and they brought those robot guys along with em! Thrill to the strange adventures of the Doom Patrol, with script by Keith Giffen and art by Matthew Clark! Whether you think you know em or you wouldnt know em if they bit you on the behind, this Doom Patrols for you! But thats not all! Read all the way to the back cover for the all-new adventures of those elemental everymen, the Metal Men, featuring the triumphant return of the creative team that brought you Justice League International! Thats 40 full pages of comic-bookery for just under four American dollars. 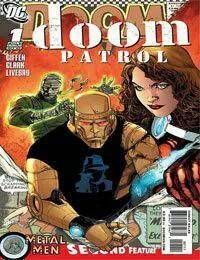 So why not try some Doom Patrol with a side order of Metal Men today?